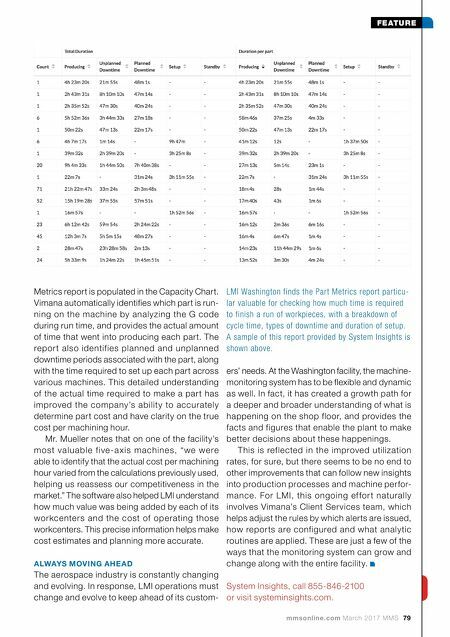 mmsonline.com March 2017 MMS 79 FEATURE Metrics report is populated in the Capacity Chart. Vimana automatically identifies which part is run- ning on the machine by analyzing the G code during run time, and provides the actual amount of time that went into producing each part. The repor t also identifies planned and unplanned downtime periods associated with the part, along with the time required to set up each part across various machines. This detailed understanding of the actual time required to make a part has improved the company's ability to accurately determine part cost and have clarity on the true cost per machining hour. Mr. Mueller notes that on one of the facility's most valuable f ive -a xis machine s, "we we re able to identify that the actual cost per machining hour varied from the calculations previously used, helping us reassess our competitiveness in the market." The software also helped LMI understand how much value was being added by each of its workcenters and the cost of operating those workcenters. This precise information helps make cost estimates and planning more accurate. ALWAYS MOVING AHEAD The aerospace industry is constantly changing and evolving. In response, LMI operations must change and evolve to keep ahead of its custom- ers' needs. At the Washington facility, the machine- monitoring system has to be flexible and dynamic as well. In fact, it has created a growth path for a deeper and broader understanding of what is happening on the shop floor, and provides the facts and figures that enable the plant to make better decisions about these happenings. This is reflected in the improved utilization rates, for sure, but there seems to be no end to other improvements that can follow new insights into production processes and machine perfor- mance. For LMI, this ongoing ef for t naturally involves Vimana's Client Services team, which helps adjust the rules by which alerts are issued, how repor ts are configured and what analy tic routines are applied. These are just a few of the ways that the monitoring system can grow and change along with the entire facility. 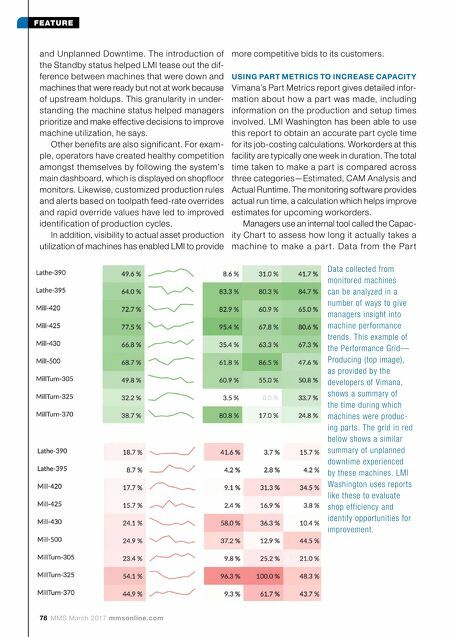 LMI Washington finds the Part Metrics report particu- lar valuable for checking how much time is required to finish a run of workpieces, with a breakdown of cycle time, types of downtime and duration of setup. A sample of this report provided by System Insights is shown above. System Insights, call 855-846-2100 or visit systeminsights.com.